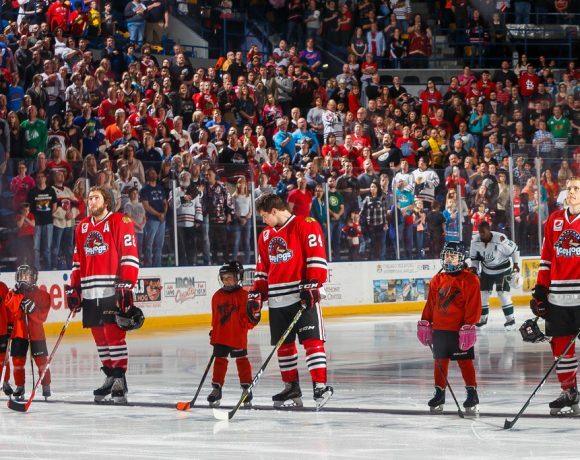 The Rockford IceHogs got their Calder Cup quest off to a flying start over the weekend. Coming into the postseason as the fourth seed in the Central Division, the piglets sent quite the opening salvo against the Chicago Wolves. 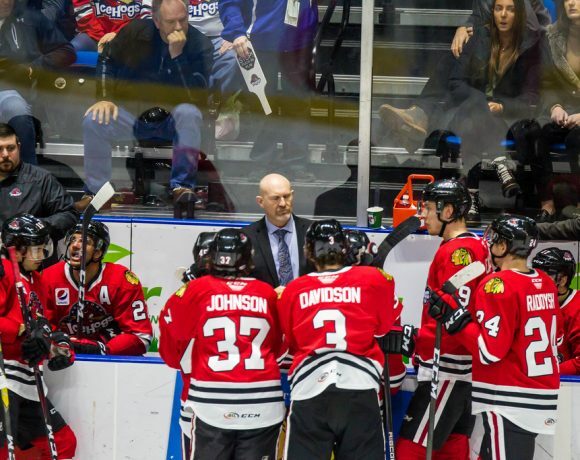 Silencing most of Chicago’s big offensive guns, the IceHogs raced out to a 2-0 series lead, taking Game 1 in Rosemont as well as Game 2 at the BMO Harris Bank Center. The Hogs gave as good as they got on the physical side and bested the Wolves special teams in both outings. Rockford can close out the Wolves Thursday night at Allstate Arena. I’d imagine we’ll see a desperate Chicago club defending their home turf in Game 3. However, the IceHogs showed that they are capable of turning away the Wolves offensive attack when needed. Yes, Teemu Pulkkinen got a puck past Collin Delia this weekend. However, he had to knock a puck out of mid-air to do so. Brandon Pirri was held without a point in the two games, as was Wolves captain Paul Thompson. Beau Bennett, another top point producer who was held off the score sheet, left Saturday’s 2-1 win by Rockford with an apparent hand injury. He didn’t play in Game 2. Delia, starting his first two postseason games in the AHL, made key stops when the Wolves did manage to create legit scoring chances. Defensively, Rockford was adept at breaking up potential rushes in neutral ice. The IceHogs got seven goals from seven different skaters in Games 1 and 2. 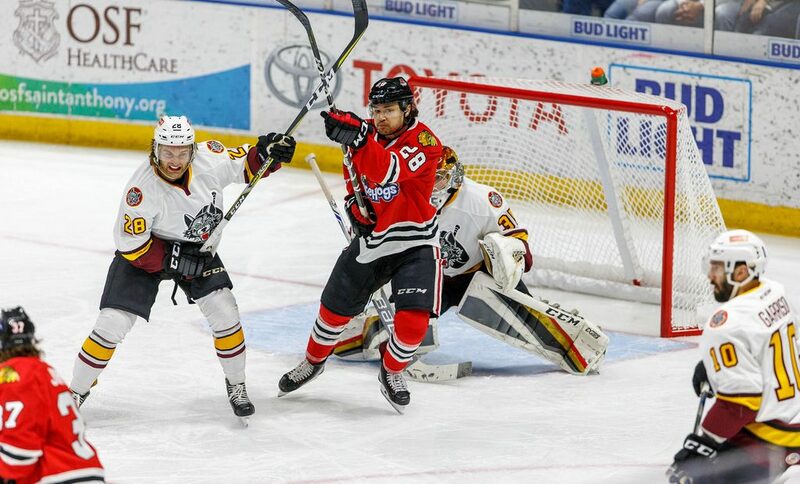 Leading the way was the trio of veterans who put a charge into the Rockford lineup in the final months of the season. Defenseman Adam Clendening scored the game-winner in Chicago and totaled four points (1 G, 3 A) for the weekend. Chris DiDomenico (1 G, 2 A) and Cody Franson (3 A) also figured heavily into the wins. Excepting the first seven or eight minutes of the opening game Saturday, Rockford has been in control of the action on the whole. As expected, the IceHogs have become a difficult opponent to play at just the right time of the spring. In a series where the penalty minutes are up a bit, Rockford has taken advantage. The Hogs found cord on five of twelve power play chances. The first unit, featuring Clendening and Franson, has four of those goals. In true playoff fashion, some big hits were delivered on both sides. As you might expect, players like Andreas Martinsen and John Hayden were making their presence felt. In addition, William Pelletier, who at 5’7″ was a frequent target in the regular season, finished some checks with a little snarl. Chicago’s Brett Sterling attempted to sell a high-sticking infraction by Matthew Highmore in the first period Saturday night. The Wolves broadcast team bemoaned the lack of a call, but the replays showed that Highmore’s stick was never in the same zip-code as the veteran winger’s chin. Bennett is a big loss for Chicago if he continues to miss action Thursday. Meanwhile, Tanner Kero returned from an injury and played Sunday for the IceHogs. A deep Rockford team gets a little deeper. 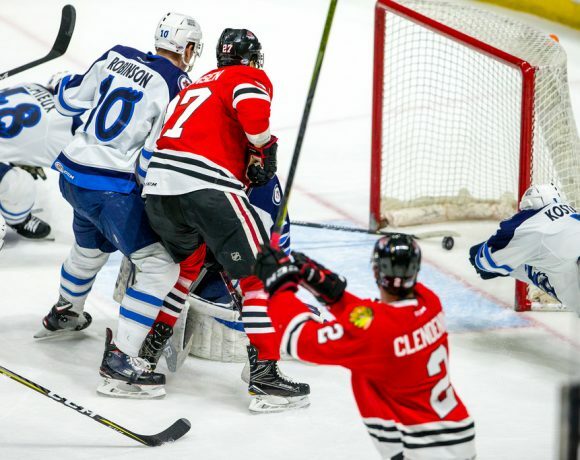 The 5,000-plus at the BMO got to their feet when the IceHogs killed the Chicago 5-on-3 to remain up a goal early in the second period on Sunday. It was the turning point of the game, no question. Special teams decided the opening game of the series. The Hogs got two power play goals and made that stand up to take Game 1 on the road. The Wolves were all over the Rockford zone in the first period, creating chance after chance that either missed the net or was turned away by Hogs goalie Collin Delia. The Wolves were denied on 16 attempts in the opening period. Rockford gained a 1-0 advantage on the game’s first power play. As he has done with regularity, Cody Franson waited at the left dot for Adam Clendening’s pass. The shot was deflected by Tyler Sikura, off Chicago goalie Oscar Dansk’s glove and into the Wolves cage at 9:44 of the first. A slashing call against Beau Bennett put the Hogs on the man advantage early in the second period. Rockford converted on the chance when Clendening sent a wrist shot through traffic and past Dansk for a 2-0 IceHogs lead at the 2:05 mark. The home team was able to get on the scoreboard five minutes into the final frame. Teemu Pulkkinen, with the Wolves on the power play, was in front of the net when a Zac Leslie shot came off of Delia’s pads. The talented forward batted the puck into the net from just under crossbar height to cut the Rockford lead to 2-1 with 14:29 remaining in the contest. On a night where neither club could find twine at even strength, the Hogs made their pair of goals stand up. The Wolves put on a frantic effort in the final minutes with Dansk on the bench to no avail. Delia wound up with 31 saves on 32 shots. Clendening, with a goal and an assist on the evening, was named the game’s first star, followed by Franson and Leslie. Rockford broke open a close game in the second period. Once again, most of the damage was done while up a man. The Wolves took a 1-0 lead midway through the first when Wade Megan put back a rebound left by Hogs goalie Collin Delia off a Zac Leslie shot. At the 13:24 mark, William Pelletier returned the favor, scoring his first goal of the postseason to tie the score. There was much action in the final minute of the opening frame. The Hogs power play notched a goal when Luke Johnson pounced on a Cody Franson shot that rebounded off the pads of Chicago goalie Oscar Dansk. Rockford led 2-1 at 19:08 of the first, but that lead proved to be short-lived. As the final seconds were ticking away in period one, Dansk got an outlet pass to T.J. Tynan coming into the Hogs zone. Delia stopped the resulting shot, but Leslie followed up by knocking the rebound into the Rockford net just before the clock ran out. The 2-2 contest was decided in the middle 20; Rockford got the eventual game-winner from Matthew Highmore 3:47 into the second. The rookie received a pass from Victor Ejdsell at the left circle and sent a shot off of the arm of Dansk and into the net. From there, the key stretch involved special teams. The Hogs killed off a two-man Wolves advantage, then found themselves on a 5-on-3 of their own ten minutes later. At the 16:04 mark, Chris DiDomenico got open in the slot, took a feed from Ejdsell, and cued the horn for Rockford’s third power play tally of the game. The IceHogs led 4-2. The third period was controlled by Rockford, who held the desperate Wolves to just three shots on goal. Lance Bouma added an empty net goal with 39 seconds to go, slamming the door on Chicago. Delia earned first star honors with his 28-save performance. DiDomenico and Clendening rounded out the three stars. Rockford can advance to the second round with a win Thursday night at Allstate Arena. Follow me @JonFromi on twitter for updates on the action in Game 3.